Josef Szynkman, commander of the Jewish Ghetto Police in Warsaw, receives a report from Jakub Lejkin, his deputy, May 1941. Source: Wikipedia from Knobloch Ludwig, German Federal Archives. Warsaw Ghetto: Crowds in front of former Business School at Prosta 14 (14/16?) street intersection with Waliców 2/4. 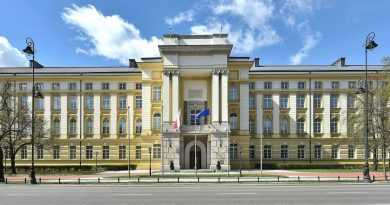 During WWII this building was housing different government institutions. 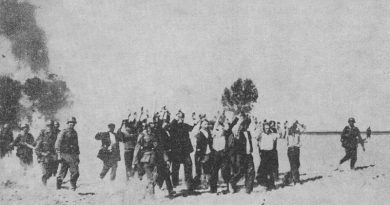 Crowds are likely due to one of two large actions to register forced laborers from Ghetto. Source: Wikipedia from Knobloch Ludwig, German Federal Archives. 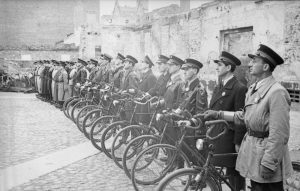 Warsaw Ghetto: Bicycle company of Jewish Order Service. Source: Wikipedia from Knobloch Ludwig, German Federal Archives. 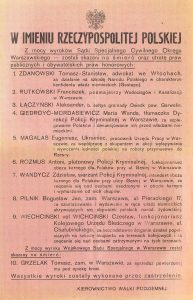 List of the Polish betrayers executed by the Polish Underground. Source: Wikipedia from Bartoszewski, 1859 dni Warszawy, wydawnictwo Znak, Kraków 2008, photo between pages 448 and 449. German cavalry enters the Polish city of Łódź Litzmannstadt greeted by members of the city considerable ethnic German community (according to historians like Richard Lukas many Polish Nazi collaborators – Volksdeutsche – were recruted from the German minority in Poland). Source: Wikipedia from German official photographer – Imperial War Museum. 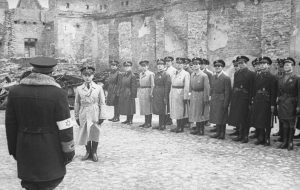 Please note: German Wehrmacht used the pictures of Jewish policemen as a propaganda tool to discredit the Jewish nation. Millions of innocent Jews were killed by Nazi Germans. The fact of Jewish collaboration with German occupiers should in no way serve as a purpose to blame the whole Jewish nation for the Holocaust. Similarly, the isolated cases of Polish collaboration with Germans should not burden with responsibility the entire Polish nation. Ethnic Poles were victims of the genocide too. They were the first prisoners of the German concentration and death camps. 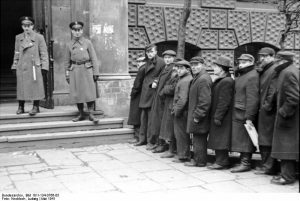 In Warsaw there were more than 100,000 Poles involved in the rescue of Polish Jews. 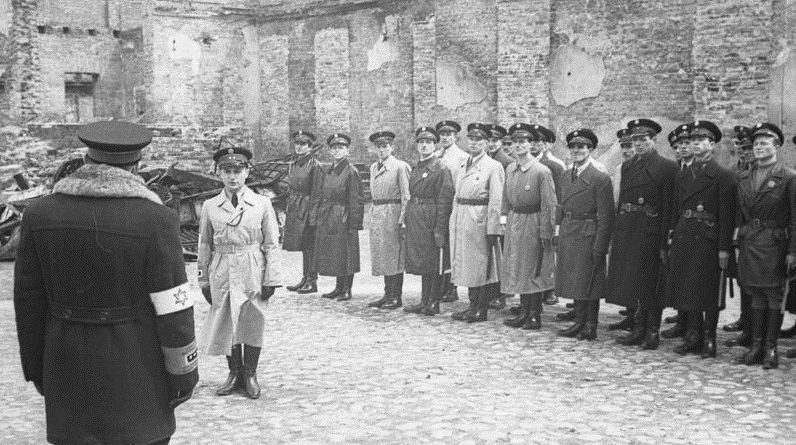 At the same time, in the Polish capital there were about 3,000 Nazi collaborators. The betrayers like Eugeniusz Świerczewski or Władysław Bielecki were abhored by the Polish society and were executed by the Polish Underground. 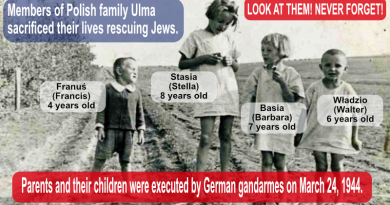 Today, the Israeli politicians and the Israeli propaganda machine Hasbara deny the Jewish collaboration and spread false accuations of Polish complicity in the Holocaust. The falsification of history by Israel and various Jewish organizations weakens the international position of Poland, and paves the way for more aggressive steps like for instance Acts S. 447 and H.R. 1226. The US. Congressmen should take into accunt this dirty game and reject the bills.